Gabriel Jesus' fourth minute header was enough to see off a resilient Brighton, but City were arguably fortunate to win the game. Speaking on BBC One after the final whistle, former City midfielder Yaya Toure said: "I was a little bit concerned because City lacked energy. They were sloppy. After the first goal we saw more of Brighton than we did of City. Maybe if they had faced a better team they would be out." Former Tottenham man Jermaine Jenas agreed. He said: "Manchester City will play better against Tottenham on Tuesday. I guarantee that. They're playing at 50 per cent now. They're going to start stepping it up as we go into the season run-in. "Brighton can bring you down to their level sometimes by sitting off. 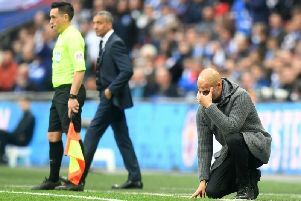 "You can see that the Brighton fans are very proud of their team, but watching them I feel they've missed an opportunity here because I've never seen City so poor and so sloppy in certain parts of their game. "I think if Brighton gambled a bit more, especially in that second half, they might be going into extra-time, they might have nicked a win. Who knows?" England and Newcastle legend Alan Shearer claimed Albion 'lacked quality' in a 'terrible game'. He said: "There were two bits of quality - the goal and in the 93rd minute when City broke and Raheem Sterling forced the save from Mat Ryan. "Other than that it was a poor standard. Yes, City won the game, but they didn't have to play well at all. 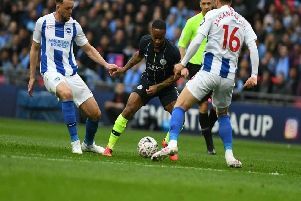 "Brighton, unfortunately, just lacked that bit of quality to take advantage of a poor day for City. I think a better team would definitely have asked more questions."